"All the Light There Was" is a wartime romance depicting the plight of the Armenians exiled to France after the massacre of 1915. Maral Pegorian is only fourteen when the German army invades Paris. This is the story of how her family survives and copes with the dangers of living in Occupied Paris during the Second World War. Maral (the Armenian for “Maria”), her brother Missak (Michael) and her parents are close friends with the Kacherian family. The reader is caught up in the events of a small family in a suburb of Paris during the war. When Zaven (Stephen)and Barkev (Bernard) Kacherian go into hiding to avoid the German conscription, we fear for them along with Maral. All the way through this novel we are pulling for Zaven to make it through, along with his brother Barkev. Written on the card were the words 'Don’t worry. We are fine. B & Z'. I was so impressed when Maral's family ignore all danger to themselves and take in Claire, a five year old Jewish girl whose family is deported. “You are a very good girl,” I replied. “When do you think they will come get me?” Claire asked. We all looked uneasily at one another. A fast read for me, I found this novel hard to put down. It wasn't difficult reading and the plot moves quickly. 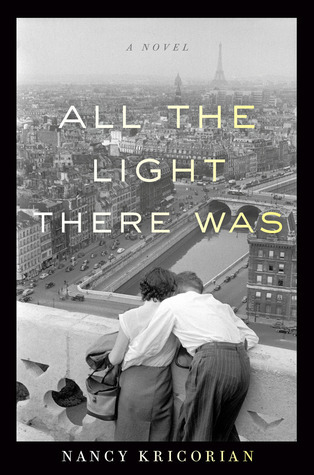 "All the Light There Was" illustrates through fictional characters perseverance in difficult times, stoicism through hardship (just getting enough food with rationing and shortages was a challenge), faithfulness to family and friends (and sometimes, strangers), in difficult times, and courage. “Finally, on Thursday evening, the electricity came on again, and my father turned on the radio and twisted the dial until he found a voice. we heard an announcement from something calling itself the Radio of the French Nation saying that the first French troops led by General Leclerc had entered the capital...By Saturday evening, the liberation had been accomplished. That night all the churches of the city set their bells ringing. My father, Missak, and I headed to join a crowd at the Parc de Belleville, where we watched celebratory fireworks showering over the Hotel de Ville. "After I had read through an enormous stack of books—historical studies, memoirs, novels, and collections of letters—about what the French called Les Années Noires (The Dark Years), I planned a research trip to Paris. I wanted to walk the streets of Belleville, the neighborhood where the Pegorians lived. I wanted to visit the Lycée Victor Hugo where Maral was a student. Most importantly, I wanted to talk with Armenians who had lived through the Occupation. If you like World War 2 fiction, don't miss this one. Sign into Goodreads to see if any of your friends have read All the Light There Was. I love your review Theresa, I am adding this one to the list! Julie wrote: "I love your review Theresa, I am adding this one to the list!" Thank you for your thorough and thoughtful review! Nancy wrote: "Thank you for your thorough and thoughtful review!" Thank you for writing it! I hope you continue to write; I really enjoyed this one!